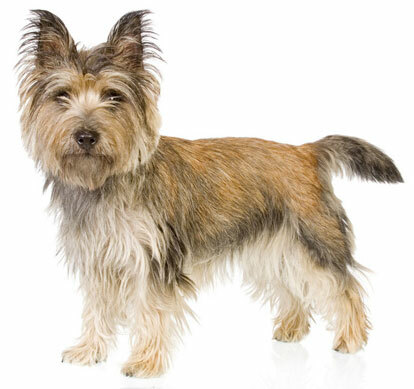 The Cairn Terrier is a loyal, lively, energetic, brave, playful and assertive dog. He is a wonderful companion who loves games and activity, but is generally not a cuddly dog. He needs lots of outdoor exercise--just playing in the living room isn't enough for him! He shouldn't be left alone in a yard or he might start digging or barking. He needs lots of attention and to use his active mind. He needs a daily walk, and lots of fun and games. He should always be walked on a leash, because he will chase small animals or go to investigate anything of interest. He can get along with other pets and dogs, but is sometimes aggressive toward them. He is fearless and won't back down from a challenge, so you need to be careful when he meets a new dog. He will be suspicious of strange people at first, but will grow to accept them. He loves you best and will compete assertively for your attention! Yet he's also gentle and sensitive, and can be hurt by harsh words. He is eager to learn and eager to please you, and is very trainable as long as his training is lots of fun and not too repetitious. He can sometimes be stubborn and independent. He's an exceptional watchdog because he's alert, bold and quick to bark. He is good-humored and patient with children, as long as they're careful not to tease him. He can easily gain too much weight, so be careful not to overfeed him. He is a very low shedder and so would be a good pet if you like a hair-free house. The Cairn Terrier is 10 to 13 inches tall (to shoulders) and weighs 14 to 18 pounds. He has a medium-length, wiry, double coat consisting of a wiry outer coat and a short, soft, furry undercoat. His coat color can be anything other than white: black, brindle, cream, gray, red, silver or wheat. You only need to brush him occasionally. Pet coat: Clipped short every few months. Show Coat: Stripped (dead hairs plucked out) every few months. Descended from working terriers bred to flush out otters, foxes, and rodents, and named after the "cairns" or piles of stones that marked property lines throughout the region, the Cairn Terrier was bred from Skye Terriers who originated in the highlands and islands of Western Scotland. The Scottish, West Highland and Cairn Terriers were eventually separated into different breeds, with the name Cairn Terrier of Skye chosen in 1910; this was shortened to Cairn Terrier in 1912. The breed was admitted into the AKC in 1913. His AKC popularity was 48th out of 157 breeds in 2007.